When I was pregnant with Daisy, I read somewhere that Spaghetti & Meatballs was the one thing pregnant women crave most. Oddly enough, I found that quite true. A big bowl of warm, comforting twirls of pasta with a sweet and tangy tomato sauce is such a treat on any day, especially after a long day at work. But, who has the time to make marinara sauce from scratch? It’s one of those things that needs to simmer slowly for hours on low heat. Luckily, a jar of Ragu Homestyle is waiting in the pantry. It’s the best shortcut to getting that all-day flavor without slaving in front of the hot stove all day. The sauce smells so fragrant, like an Italian grandma’s kitchen. Ragu’s sauce is all natural. It doesn’t have any artificial ingredients or chemicals. When I’m short on time and I can’t make my own marinara from scratch, I feel good about serving Ragu to my family. This is the quickest Spaghetti and Meatballs recipe in the West. Just three ingredients – Ragu Homestyle, pasta and store-bought meatballs. We went meatless and got some yummy veggie “meatballs” from Trader Joe’s. I didn’t say a word to Daisy, but she poo-poo’d them. I didn’t think they were bad at all. If you want to be fancy, add a couple splashes of marsala wine to deglaze the pan when you heat the meatballs, but the sauce is so delicious, you really don’t need the extra flavor. Ragu now has several other flavors of their Homestyle sauce. I’ve got my eye on the roasted garlic and mushroom sauces, but the Thick & Hearty classic marinara is still a big favorite at the homestead. 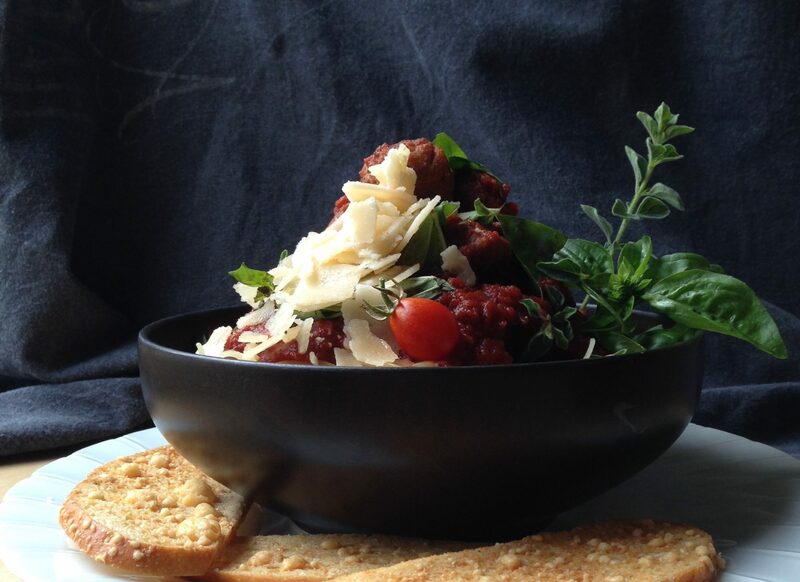 Check out Ragu’s recipe page for some inspiration and you can have a wholesome meal on the table in a hurry. Allergies are killing me today, and so I’m craving something homey and comforting. Unfortunately, I’m not coherent or motivated to cook something from scratch. Thanks to Ragu, we have another jar of Homestyle to try tonight. I hope you find this quick rendition of Spaghetti & Meatballs as comforting as I do. It’s actually such an easy dish to make, the kids can give you a well-deserved night off and take care of dinner for a change. A splash of pizazz, right? You made another quick and easy dinner! I love easy, and your recipe looks delish. Wow, your photos are stunning! You won’t believe I shot all those just with my old iPhone. Didn’t have time to grab my nice camera. This is gorgeous! I feel in love with Ragu’s new homestyle sauce when I was cooking for my post. Can’t wait to try it in this spaghetti dish! Oh yes, we love to grab the Ragu from time to time. It’s always delicious. Thanks, Stacey. Shot the pics just with my iPhone. Morning light is magical! Yum, that look so good! I craved pizza when I was pregnant, maybe it’s the tomato we wanted 🙂 I often have jars of premade sauce on hand to make a quick dinner. In fact I have baked ziti in the oven right now that I crafted with a jar to take to bocce tonight. Pizza is never a bad idea. You’re right – there’s nothing better than a tasty tomato sauce! WOW that looks so yummy!!! A nice easy mid week meal! Can’t wait to try it! Let me know how you like it, Sam! wow, you made me crave so fast I had to make sure I was not pregnant!